When you think of the word "imported," what do you imagine? A fine pinot noir from Italy? Now, I love living in Germany and there are some amazing foods here, but sometimes I have a craving for a delicacy—hey, beauty is in the eye of the beholder—from home. My kids have also vacationed in the States and long for the taste of the US. Luckily, there are a couple of shops in Germany that stock a tiny selection of imported American foods. But they come at a price. I thought you might like to see some examples. To make it easier for you to feel my pain, I added the price in US dollars according to the current exchange rate. Let's start with this 4 oz. (!) 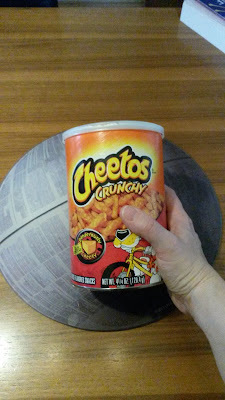 container of Cheetos. It costs 4.99 EUR ($5.40), but my daughter just had to have it, so she sacrificed two weeks worth of her allowance. When she carefully lifted the lid for the very first time, she sniffed inside the can and sighed, "That was American air in there." 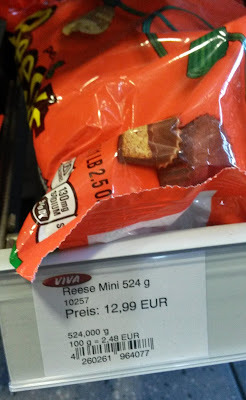 When we went to this shop, my daughter was hoping for a Hershey's Oreo candy bar too, but it cost EUR 2.19 ($2.37) and she said it was "as thin as paper." Guess she's used to the thick German chocolate bars. Anyway, she didn't have enough money for that and the Cheetos. I've been tempted by American cake mixes. But even the standard Betty Crocker yellow cake mix costs 5.50 EUR ($5.96). You can add frosting for an additional EUR 4.55 ($4.93). I make cakes from scratch now. Both of my kids would kill for a simple box of Kraft Mac & Cheese. The cheaper one with the powder goes for 2.90 EUR ($3.14) per box. In the US, you can get five boxes in a carton for $4.98. And this...this is the one that really hurts. It's the reason I hardly ever eat my absolute favorite: Reese's Peanut Butter Cups. This is a normal size bag of mini Peanut Butter Cups. The cost? A whopping 12.99 EUR ($14.07). 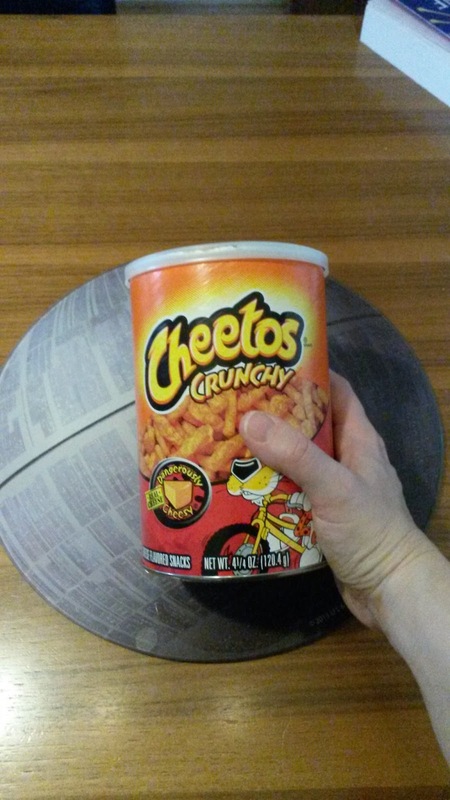 So bake a cake, crunch some Cheetos, and chase 'em down with a Reese's Peanut Butter Cup. Do it for me. I'll drown my sorrows in a bar of Swiss chocolate. If you're an expat, what food do you miss from home? If you're not, what food do you think you'd miss the most? And microwave popcorn! I can get it, but only online, and it's expensive, too. I am MAINLY happy with Japanese sweets... the chocolate here is SOOOO much better than American chocolate. But yes, sometimes you get a random craving for a specific nostalgic goodie! Hey, Kimberly! I've never made red velvet either. Tbh, I had to look up the recipe to find out what makes it red (red food coloring!). Corn Syrup is hard here too. I found it online at an American Food shop - listed as a DRINK! Can you imagine the unsuspecting person who buys it to try typical American foods? I miss the cake mixes - especially brownie mix. And Reese's. Oh god, how I miss Reese's. The asian shop here used to carry them. It was a sad day when they stopped. Liquorice, the Haribo kind - they have Haribo here, but not even the Gummibears taste the same. And Ritter SPort chocolate - they have some flavours here, but only a small sample of what actually exists, and almost twice the price. The gummy bears taste different? That's interesting. At least you can load up your car when you visit! Yes, in France they still add the artificial colouring/flavouring, I think. The German-French show Karambolage on ARTE TV had a subject on that some years ago, and I'm made a few blind tests with German and French gummibears. I can bring you some next time we meet. Ugh Reeses yes. And cereal that doesn't taste like cardboard and have the consistency of sawdust and/or cost $9 a box! Being a writer is soo much harder without the quick cereal meal I used to rely on. Hey Carissa! I know what you mean about Mexican foods/ingredients. We have the same issue here.